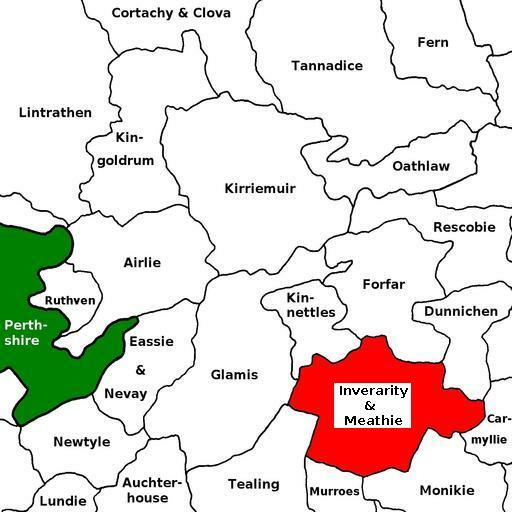 The parishes of Inverarity and Meathie-Lour were united in 1612, part of Meathie parish (Lour) being transferred to Forfar parish at that time. 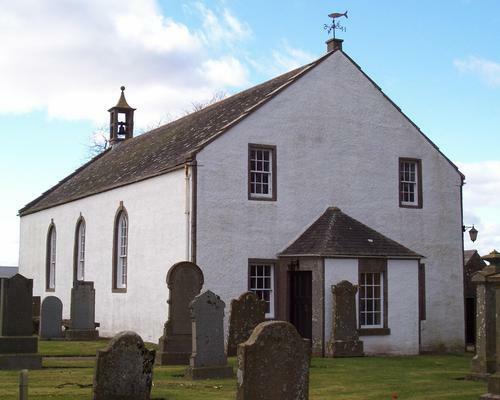 The former parish of Kirkbuddo or Carbuddo, which became a detached part of the parish of Guthrie, now forms the eastern end of Inverarity and Meathie. General histories listed on the page for Books about Angus & Kincardineshire, in particular Warden, vol. 3, pp. 400-425. For the full range of maps of Inverarity & Meathie, see National Library's Maps. See Geograph.org: Inverarity - recent photographs of Inverarity. National Grid ref. NO4544. See Geograph.org: Meathie - recent photographs of Meathie. National Grid ref. NO4646. 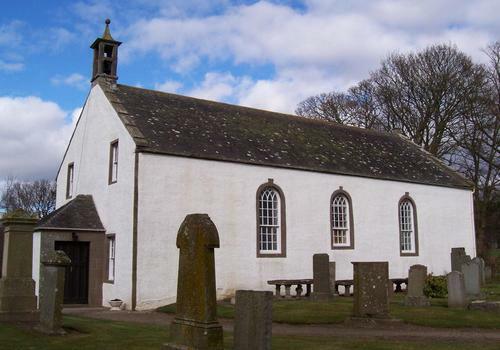 Inverarity parish kirk is located at National Grid ref. NO452443. Built 1754. The ruins of Meathie Kirk are at NO465462. William Rankine 1808-1830 ord. 3 Nov 1808; d. 11 Feb 1830; mar. 1798 Margaret Scott, who survived him; issue: Isabella; Margaret; Mary Fothringham; Ann Eliz. Fothringham; Chas F.; Wm; Thos F.; Fredk F.
Andrew Jervise recorded some monuments at Inverarity in his "Epitaphs & Inscriptions", vol. 2, pp. 298-304. 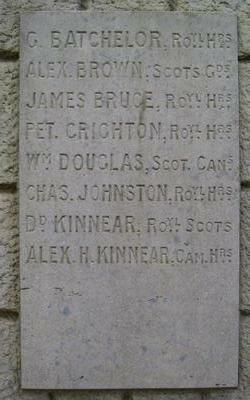 A partial listing of monuments at Kirkbuddo is given on the page for Guthrie. in memory of the Right Honourable WILLIAM EDWARD BAXTER D.L., J.P. of Kincaldrum, for 30 years member of parliament for the Montrose District of burghs, who died on the 10th of August 1890, in the 66th year of his age, eldest son of EDWARD BAXTER of Kincaldrum, and his wife EUPHEMIA WILSON. Also in memory of JANET SCOTT wife of WILLIAM EDWARD BAXTER, who died on the 7th October 1910 in the 87th year of her age. F/Lt George Lawrence, D.F.M., R.A.F. 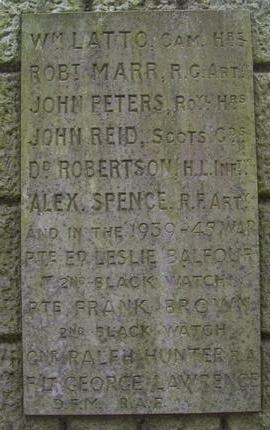 See also The Scottish War Memorials Project: Inverarity. 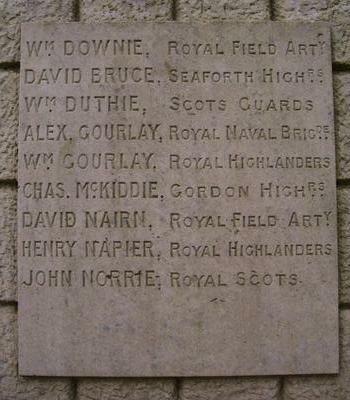 Inverarity & Meathie was in the Commissariot of St Andrews.